According to epigenetics — the study of inheritable changes in gene expression not directly coded in our DNA — our life experiences may be passed on to our children and our children’s children. Studies on survivors of traumatic events have suggested that exposure to stress may indeed have lasting effects on subsequent generations. But exactly how are these genetic “memories” passed on? The scientists discovered that specific genes, which they named “MOTEK” (Modified Transgenerational Epigenetic Kinetics), were involved in turning epigenetic transmissions on and off. These switches are controlled by a feedback interaction between gene-regulating small RNAs, which are inheritable, and the MOTEK genes that are required to produce and transmit these small RNAs across generations. The feedback determines whether epigenetic memory will continue to the progeny or not, and how long each epigenetic response will last. The researchers are now planning to study the MOTEK genes to know exactly how these genes affect the duration of epigenetic effects, and whether similar mechanisms exist in humans. * Rechavi and his team had previously identified a “small RNA inheritance” mechanism through which RNA molecules produced a response to the needs of specific cells and how they were regulated between generations. Most inheritable epigenetic responses in C.elegans worms were found to persist for only a few generations. This created the assumption that epigenetic effects simply “petered out” over time, through a process of dilution or decay. In C. elegans, small RNAs enable transmission of epigenetic responses across multiple generations. 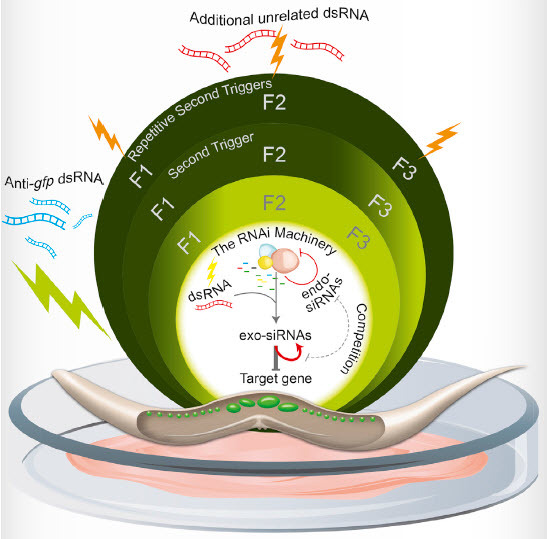 While RNAi inheritance mechanisms that enable “memorization” of ancestral responses are being elucidated, the mechanisms that determine the duration of inherited silencing and the ability to forget the inherited epigenetic effects are not known. We now show that exposure to dsRNA activates a feedback loop whereby gene-specific RNAi responses dictate the transgenerational duration of RNAi responses mounted against unrelated genes, elicited separately in previous generations. 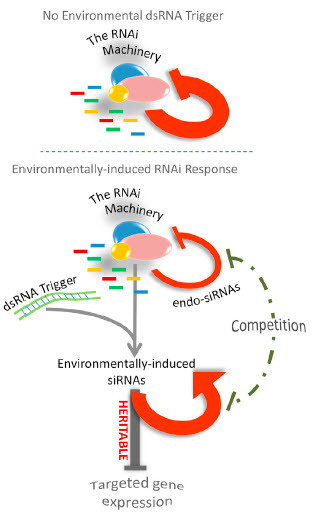 RNA-sequencing analysis reveals that, aside from silencing of genes with complementary sequences, dsRNA-induced RNAi affects the production of heritable endogenous small RNAs, which regulate the expression of RNAi factors. Manipulating genes in this feedback pathway changes the duration of heritable silencing. Such active control of transgenerational effects could be adaptive, since ancestral responses would be detrimental if the environments of the progeny and the ancestors were different.